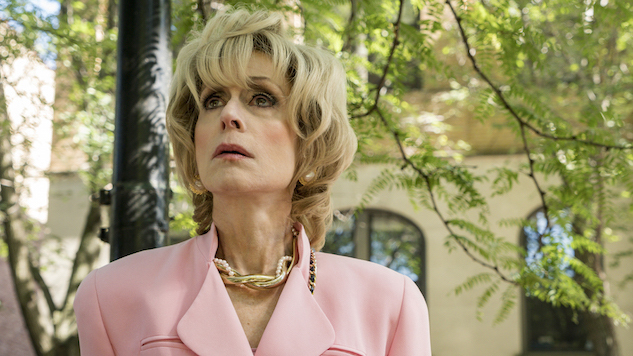 American Crime Story Review: Judith Light Steals the Show in the Excellent "A Random Killing"
Judith Light has become so… poignant. When did that happen? A couple of months before he shot Gianni Versace, Andrew Cunanan tortured and murdered Lee Miglin, a real estate mogul in Chicago. He was found by his wife, Marilyn. And that’s where we begin the third episode of The Assassination of Gianni Versace. In real life there was and still is considerable mystery around the connection between Cunanan and Miglin. In the episode, it’s not clear how they met, but when Marilyn (Light) takes off on a business trip, Miglin (Mike Farrell) goes to a chapel area in their home and prays for forgiveness for what he’s about to do. “I try,” he says plaintively. “I try.” Then he goes upstairs to meet Cunanan. It’s clear it’s not the first time, and it’s implied that he has a history of indulging in male escorts occasionally—it’s slightly less clear whether Marilyn knows this, but it seems like it. There’s a chilling moment where Miglin greets Cunanan with a very heartfelt hug and we see Cunanan just standing there like a rock. Of course we know what’s about to happen, but that only heightens the tension as Miglin shows Cunanan drawings for a new project and Cunanan responds with derision, becoming increasingly passive-aggressive and belittling before taking Miglin into his garage and, as he did in “Manhunt,” wrapping his victim’s head in tape. It seems like silencing successful older men might be the emerging through line in Cunanan’s killing spree. But it goes deeper than that, too, and deeper than mere psychopathy. Cunanan makes it fairly clear that he knows he’s a psychopath. “This is who I really am,” he tells the gagged and bound Miglin. The scene of the murder unfolds excruciatingly slowly, as Cunanan tells Miglin he’ll be wearing women’s underwear when his body is found and that everyone will know he’s gay. “What frightens you more,” Cunanan asks, “death, or disgrace? Disgrace.” He then crushes Miglin’s body with a bag of concrete—the use of a building material is clearly part of the “disgracing” of a man who builds things. After further defacing his victim’s body, he goes back upstairs, takes Miglin’s drawings, and burns them in the chapel. At this point I’m wondering if anyone could possibly outdo Darren Criss in a Terrifying Stone-Cold Stare competition; the guy’s just mesmerizingly scary. You get a sense of fathomless rage, deep self-loathing coupled with narcissistic grandiosity, and a desperate desire to be more than what he knows he really is. Cunanan drives to New York City, where he is drawn by the windows of… yep, the Versace atelier. (By now, even the shot of his foot walking across the mosaic tile floor’s gorgon-head logo is completely ominous.) Unfortunately, someone’s leaked the fact that the police are using Miglin’s car phone to track Cunanan, and he hears about it on the radio, resulting in another execution, this time of a complete stranger whose truck he then steals. But as great as Criss’ performance is, this episode belongs to Judith Light. As Marilyn Miglin she is incredibly nuanced. Obsessed with appearances yet unapologetic about what’s underneath. Cold, but brimming over with barely containable emotion. Defensive, but wide-open. Dignified and brave and oblique and sad, prideful and angry yet strangely resigned. It’s a beautiful performance and she absolutely owns the camera in every scene she’s in. Especially the last one, in which she goes back to her shopping-channel TV program (she’s created a perfume called “Pheromone,” which has a whole twisted poetry of its own if we consider her as a woman whose marriage might have been extremely perfunctory at the sexual level) and says she wants to go back to work because her husband was and still is part of everything she does. She says a friend of hers who had a TV program had once given her some advice about being in front of a camera: “Imagine that little red light is the man you love,” she says, staring straight at the lens, faintly smiling, eyes lit with unshed tears. It’s a phenomenal cut-to-black ending. Meanwhile the wheels, literal and figurative, are now spinning toward the death of Gianni Versace.